We all love the look of an intricate fishtail braid, whether it’s for a laid back weekend away or to hide weather worn worn locks – but many of us are stumped when it comes to creating our very own woven work of art! So here at BPR HQ, we’ve created a step by step tutorial for a fool-proof fishtail braid that Freida would be proud of… you can thank us later! To begin, gather your hair into a ponytail at the base of your neck and tie securely. Make sure you use an elastic that you won’t mind throwing away- you’ll be cutting this away with scissors at the end! Next, part your ponytail evenly into two sections. 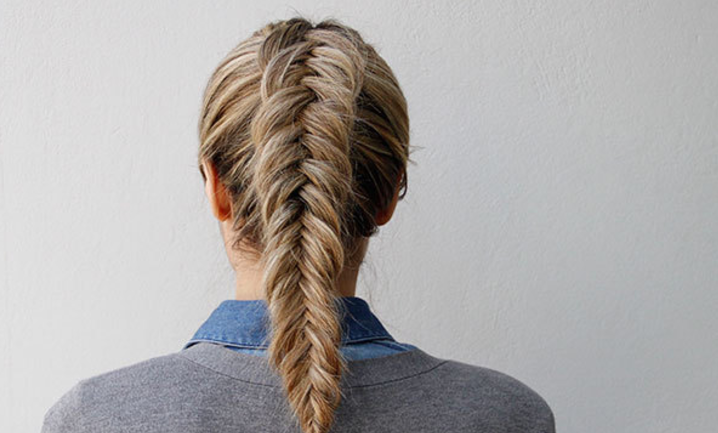 Unlike the classic plait, a fishtail braid only requires two sections. Separate a small section of your hair from the outer edge near the elastic (toward the back of the pony) and cross it over to the opposite side/ section (simply overlapping just like you would if you were doing a standard plait). Readjust your grip to add tension to your hair to tighten plait, still holding two sections. Repeat with a small section from the other side. Continue overlapping pieces from both sides of your ponytail, all the way down to your ends. Be sure to pull small sections from underneath to cross over, and try to maintain the same size (about a half inch) sections from each side so your plait is even! Once you’ve woven your locks down to the ends, secure the fishtail braid with another elastic (we chose Invisibobble invisible hair ties). Then, use scissors to carefully cut out the elastic at the top of your ponytail. Finish your fishtail plait by gently tugging on your braid sideways with your fingers to loosen the plait for an effortless look. You can also pull out fine strands and add hair accessories (such as flowers and Regal Rose hair rings) to add a laid back, boho vibe to your hair masterpiece.